BACK ON MARKET! BUYER'S FINANCING FEEL THROUGH!LISTED AT APPRAISED VALUE! INSPECTIONS DONE AND NEW ROOF BEING INSTALLED PRIOR TO CLOSING! BEAUTIFUL 3 Bedroom, 2 Bath, 2 car garage home with NO BACKYARD NEIGHBORS! As you step through the front door into the foyer you will find a LARGE FAMILY ROOM with HIGH CEILINGS, a WOOD BURNING FIREPLACE and SLIDERS that OPEN to the LARGE SCREENED LANAI! The family room is also open to the DINING AREA which features a BREAKFAST BAR/PASS THROUGH to the KITCHEN! In the kitchen you will find HIGH CEILINGS, TONS of CABINET and COUNTER SPACE and a PANTRY CLOSET! BEDROOMS are arranged in a great 3-WAY SPLIT with the second bedroom being located off the foyer. This bedroom has FRENCH DOORS so it also perfect for a HOME OFFICE/GUEST ROOM! Located off the kitchen you will find the second bath, third bedroom and a LARGE LAUNDRY ROOM that leads to the GARAGE. The MASTER SUITE is located on the other side of the home off the family room! This LARGE master suite features HIGH CEILINGS and LAMINATE FLOORS. The master bath features HIS and HER SINKS, a LARGE SHOWER STALL and WALK-IN CLOSET. The bedrooms SLIDERS open to the LARGE LANAI with a HOT TUB that STAYS with the HOME! RELAX and ENJOY your HOT TUB while OVERLOOKING the CONSERVATION AREA and CREATE YOUR OWN OUTDOOR OASIS! The backyard is fully fenced! The community features a large park and playground. 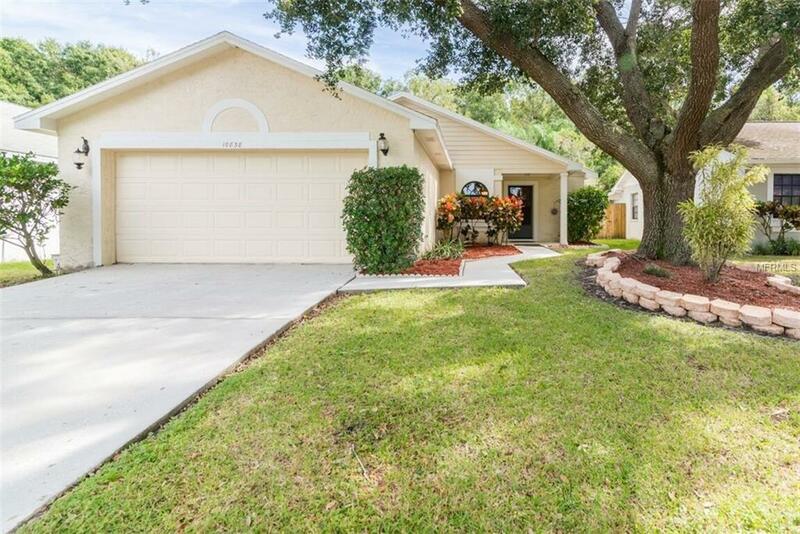 This home has a LOW ANNUAL HOA FEE, NO CDD and is close to Highway 301, I-75 and I-4 with easy access to Tampa and MacDill AFB. Additional Lease Restrictions Contact Leland Management For Questions Regarding Lease Restrictions.